Follow the easy steps below to check your gift card balance. 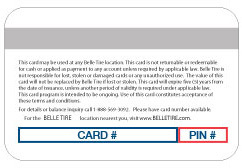 If you have questions or would like to re-load your card please contact 1-888-569-3092 or stop by any Belle Tire location. © 2019 Belle Tire Distributors, Inc.